There are a lot of factors to consider when deciding which college or university to attend; costs, location, degrees. But what about their carbon footprint? Or their efforts to preserve wildlife? Have you considered attending one of the greenest campuses in America? Many colleges are making an effort to become more eco-friendly with regards to recycling efforts across campus by using less paper. Some are implementing solar panels for main buildings, while others grow their own vegetables for the dining halls. At the University of California in Irvine, eco-friendly measures are a main focus for the campus. They have a large scale initiative of sustainability, and a good portion of the research conducted on campus revolves around eight specific areas: clean energy, climate protection, green building, environmentally preferable purchasing, transportation, waste reduction and recycling, sustainable operations, and sustainable food service. Not only do they provide classes about these efforts, but their campus is run to implement the most effective environmentally friendly solutions; one example being that they save almost 90 million gallons of water a year. Colorado State University is a leader of the nation among green practices, both in research and on campus. The University is home to a solar-heated/air conditioned building, the first of its kind. They have also helped in efforts to monitor climate change by studying the clouds and working alongside NASA. Over 90% of the research done on campus revolves around sustainability efforts and offers over one hundred eco-friendly courses, not to mention their original Greenhouse Gas Management and Accounting program. As a top ranking school, the University of North Carolina at Chapel Hill has also lent themselves to become among the elite as an environmentally friendly school. Their biggest accomplishment being their platinum-certified Botanical Gardens Education Center. The project itself used resources from a five hundred mile radius and now helps collect rainwater while simultaneously filtering the water. Solar panels complete the building and help generate about 8%t of the energy needed yearly on campus. Loyola University Chicago features an institute of environmental sustainability that drives the school’s research and efforts in helping the community. Their initiatives in climate change, recycling, and composting are all top notch. Due to their location, they also have efforts in urban agriculture that they study in a 3,100 square foot greenhouse. The school also takes part in a farmer’s market each week to provide healthy food for students and the community. The main focus of Green Mountain College is helping the environment, a theme that is present in every program offered at the school. Students are required to take approximately 40 credit hours of environment-focused courses in order to graduate. The campus has a goal to use one 100% renewable energy over the entire campus by the year 2020, and are steadily increasing their efforts to achieve this goal. They recently introduced a new bio plant that accounts for almost 90% of the college’s heat and water. Sustainability is a growing effort at the University of Wisconsin – Oshkosh with their environmental research and innovation center continuing their “going green” programs. The newest goals at the University of Wisconsin include reducing consumption and waste. These goals are being achieved with solar panels and green transportation, which also plays into the school’s research on decreasing pollution. The campus is looking into purchasing green buildings and keeping sustainable landscapes. With regards to academic studies, the school is starting to introduce new courses that have an environmental focus. Aside from the beautiful campus surrounded by greenery, Lewis & Clark College is quickly becoming a more environmentally friendly campus. The campus itself is solar powered, and in an effort to reduce waste, most places do not sell plastic water bottles. Their biggest contribution to sustainability efforts though is the incredible food program. One-fourth of the food served in cafeterias, and across campus, come from within a 100-mile radius. Not only that, but the meat that they serve is antibiotic and hormone free. Oberlin College is currently taking sustainability measures into their own innovative hands. They have implemented solar panels across campus, and car sharing programs to help reduce their carbon footprint, and they have introduced unique programs to promote an eco-friendly environment. Using social media, the school encourage students, and the community, to join efforts in helping the environment. The campus also started the Ecolympics where dorms and schools compete to reduce water and electricity. The University of Washington is promoting sustainability goals for the campus by focusing on getting the students involved. To encourage students to remember the efforts happening, a pledge was created on campus. The pledge asks students to agree to help the school become eco-friendly. Many of the organizations on campus are inspired by these ideas of helping the environment and are referred to as green teams. The school also offers a tool to help students calculate their commute and figure out a route that leaves less of an impact. Middlebury College was the first in the nation to introduce an environmental studies program. The school has since kept leading innovations in sustainability projects. They have increased efforts in recycling, compost, and climate change. This year marks their deadline to achieve carbon neutrality, which they are on track for as of now. They are also working towards the goal of meeting the Real Food Challenge. The Real Food Challenge means that the school imports local foods, provides fair working conditions, and is focused on humane animal treatment. At the University of Connecticut, sustainability initiatives have been in place since 2002, focussing on; climate change, green building, and water conservation. The school has developed an Environmental Policy Advisory Council that overlooks the campus’ environmental efforts with regards to recycling, climate, energy, and water conservation. A student organization is also in place that plans projects and events with other eco-friendly clubs and groups. Dickinson College features a Center for Sustainability Education where all courses, research, and activities to do with sustainability efforts stem from. The college also offers a fifty-acre farm that is responsible for providing food for the dining halls and the community through a weekly farmer’s market. In order to reach their goal of becoming carbon neutral in 2020, the school created an energy dashboard that tracks current school emissions. Cornell University has made a conscious effort to create a sustainable campus through multiple initiatives. It focuses heavily on leaving a positive impact on the environment, and even offers redeemable points to those who refill bottles instead of buying plastic water bottles in order to decrease the amount of plastic in local landfills. Cornell also encourages students and teachers alike to bring an element of green into their offices, labs, and events. 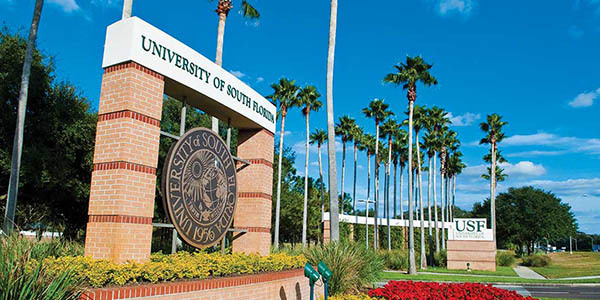 The University of South Florida is currently working their way towards becoming a sustainable campus, and an overall “Green University” through multiple initiatives. They are conducting research in urban metabolism, urban water, and urban form in addition to looking at sources of renewable energy, and the effect that global changes like pollution have. The school also plays a role in the Tampa Bay Clean Cities Coalition, trying to keep the local area eco-friendly.